Painted tulips line one of the sidewalks at the Oswego Middle School. OSWEGO, NY – Erin Platten loves to garden and loves flowers. She loves to watch her own children’s excitement when she plants seeds and they later push through the surface and bring joy, hope and endless possibilities. Oswego Middle School Art Students stand proudly with their painted tulip flower garden outside of the school building. 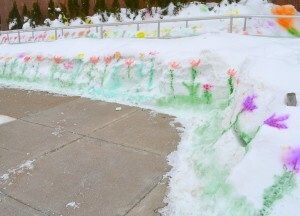 Platten, an art teacher at the Oswego Middle School, wanted to provide some similar hope, joy and possibilities to her art students recently, to offset the continued long winter in Oswego. “It’s been a long, cold winter, and everyone is working hard to tough out the cold and snow, but it seems every time we have hope that the end of the season is near, there is more snow and brutal cold air,” she said. “I knew it was time to cheer up everyone at Oswego Middle School, so I found a fun project online that I could do with my students, and hopefully make a positive impact on everyone,” Platten added. 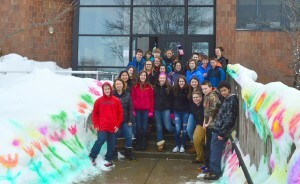 The project, according to Platten, was an uplifting couple of days, filled with painting colorful tulips on the snow banks outside of the school building – creating a flower garden. “I approached our other school art teacher, Linda Shannon, about the idea and discussed combining the classes for the project. When we did, the kids had a blast and you could hear the excitement it was bringing them,” she said. According to Platten, the students “braved the cold” for two days, to paint the tulips all around the building. And while the artwork may only last a couple of days, Platten said she is hopeful the project will stay in everyone’s hearts and minds, until the joy of spring is truly upon us, and the real flowers bless our presence.